Paralympic gold medallist Stephen Miller has decided to continue his career despite losing all funding from UK Athletics following London 2012. Team captain Miller, who has won three golds for Great Britain in the club throw, failed to qualify for the final of this summer's Games. "I have to accept the decision and move on," he told BBC Look North. "I'm still hungry as an athlete and I have ambitions for my career. I still want to achieve things in sport." UK Athletics has changed the criteria for the World Class Performance funding scheme. Following Neil Black's appointment as performance director, only athletes deemed to be medal hopes will receive funding instead of anyone thought capable of finishing in the top eight. The main disappointment for Miller, who also won a discus bronze at the 2000 Paralympics in Sydney, is that his performances in London were affected by hip problems but he has since undergone surgery and hopes that he can now rediscover his best. 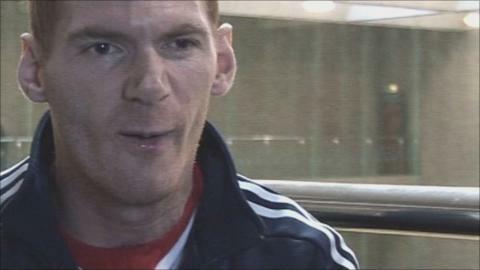 "It is disappointing, as I had the injury for a long time but I battled on with it - which was my choice,"
"But I won medals and major championship despite the hip, but it just happened to flare up at the wrong time, when it came to the big one [in London]," said the 32-year-old from Cramlington. "It's not even six weeks yet [since the operation] and I've already done a bit of walking, it's the first time in three years that I've been able to walk. "So the operation couldn't have gone any better and the surgeons are very happy, so hopefully I can make a full recovery and get back to what I love to do."